JiayuguanJiayuguan, a recently developing industrial city of iron-steel production, is located in the middle of Hexi Corridor, Gansu. It is rich in tourist resources and there are many renowned places of historic interest and scenic beauty such as the Jiayuguan Pass. Other attractions include: the Overhanging Great Wall), the First Fire Tower of the Great Wall, Wei-Jin Art Gallery and other natural scenes which become the must-see for your Silk Road travel. 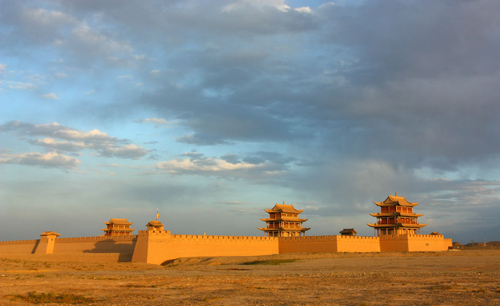 Jiayuguan has a history over 630 years. In 1372, during the Ming Dynasty, a fortress was built to protect the last frontier of the Chinese empire. It was completely built up in 1540 and became a small township engaged in local trading, catering to the needs of the military garrisons stationed at the fort. The city was used to be the pass of the famous Silk Road and the first pass at the west end of the Great Wall in the Ming Dynasty. A fabulous legend recounts the meticulous planning involved in the construction of the pass. According to legend, when Jiayuguan was being planned, the official in charge asked the designer to estimate the exact number of bricks required and the designer gave him a number (99999). The official questioned his judgment, asking him if that would be enough, so the designer added one brick. When Jiayuguan was finished, there was one brick left over, which was placed loose on one of the gates where it remains today. Jiayuguan City is located at 98°17' east longitude and 39°47' north latitude. It lies in the Gobi desert, at the middle of Hexi Corridor, 776 kilometers away from Lanzhou and 5 - 6 hours away by bus from Dunhuang. It is seated in the northwest of Gansu Province, with Yumen to its west, the snow-capped Qilian Mountain to its south. Jiayuguan possesses a continental desert climate, with an annual precipitation of only 80 millimeters in summer. The average temperature of Jiayuguan is about 6.7 C (44 F) – 7.7 C (18.1 F) and the lowest temperature is -21 C (-5.8 F) in January while the highest is 34 C (93 F) in July. With an average altitude of 1,500 meters (4,921 feet), even older travelers will find it comfortable. 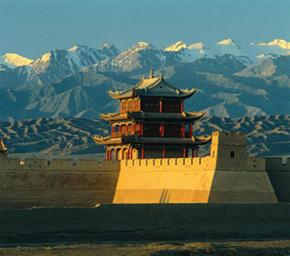 Located about six kilometers (four miles) southwest of Jiangyuguan City in Gansu Province, the Jiayuguan Pass (Jiayuguan in Chinese) represents the western starting point of a section of the Great Wall constructed during the Ming Dynasty (1368-1644). The pass covers an area of 33,500 square meters (eight acres) and lies at the base of a narrow valley, and takes its name from one of the surrounding hills, the Jiayu. Commonly referred to as the finest example of its kind on earth, the pass is the best preserved of the Great Wall's ancient military fortresses. 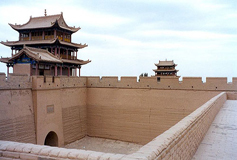 The Jiayuguan Pass is constructed in three concentric layers: the central area is made up of an inner city, containing the largest of the pass' buildings; an outer city section, surrounded by a large wall dotted with watchtowers, turrets, and high-terrace pavilions; and finally, for purposes of defense, a moat. All of these features combined to make it a daunting prospect for any would-be attackers. In the inner city are some tourist spots including Youji Jiangjun (an official title)'s Mansion, Wenchang Hall and Jing Pavilion. Found outside the fort's east gate are the Guandi Temple, a series of grand archways and a theater tower. On the west side stands a grand stele housed in a pavilion. The four Chinese characters found etched on its surface - 'Tian', 'Xia', 'Xiong' and 'Guan' - were written by Li Tingchen, a Qing Dynasty (1644-1911) commander. 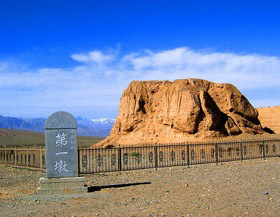 There are also a number of other historical sites to be found in the Jiayuguan Pass region for the private China tours. These include the Overhanging Great Wall in the north and the First Frusta in the south. 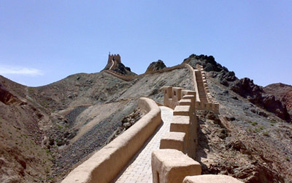 Located seven miles from Jiayuguan City in Gansu Province and four miles northwest of the pass city of Jiayuguan Pass, the Overhanging Great Wall is an important part of the defensive work of Jiayuguan Pass. It was built in the year 1539 during the Ming Dynasty (1368 - 1644) in order to strengthen the defensive capability of the Jiayuguan area. Built on the eastern slope of Mt. Heishan (Black Mountain) the Great Wall isnot visible to anyone looking from west to east. Enemies thought they could enterinner China from here, the Heishan Canyon, as long as they rounded the Jiayuguan Pass. However, they were totally mistaken. After they went over the mountainwith great difficulty, they found a very firm Great Wall in their path that was impossible to cross. Therefore, this place has always been considered a natural barrier. Along the steps of the Overhanging Great Wall, you can start from the foot of Mt. Heishan to reach the top of the mountain. The steps are so steep that it's not easy for weaker people to reach the summit. Standing at the top of the walland scanning widely, you will see the boundless desert extending to faraway places, with the rare oasis dropped in. What a desolate and lonely view! Transportation: In Jiayuguan City, you can take a taxi to visit the attractions of the city. If you want to go to Jiayuguan Pass and the Overhanging Great Wall, it will be very convenient. On the way, you will also have a chance to see the First Fire Tower under the Heaven. The cost of taking a taxi to those three scenic spots is generally around CNY80. About seven kilometers (4.35 miles) south of Jiayuguan City lies the first fire tower of the Great Wall. It is the first frustum of the Ming Great Wall from west to east and also the western beginning of the Ming Great Wall. The fire tower is located on the cliff at a height of about 80 meters (262 feet) by the Talai River. It plays a very important role in Jiayuguan Great Wall's defense system and regarded as the First Dangerous Fire Tower under the Heaven. The scenery around the First Fire tower is very spectacular. It adjoins Jiuquan, Gansu Province on the east, the wild dessert on the west, the Jiayuguan Pass on the north and the Qilian Mountain on the south. The Talai River runs torrentially from here to the east. In the morning sun, the sky here seems extraordinarily blue; at dusk, looking far into the distance on the tower, you can find the snow peaks of the distant mountains are much whiter and more magnificent. Standing on the tower, visitors can experience the grandeur of an ancient civilization while appreciating the marvelous view of the vast Gobi. Located about 15 kilometers northeast of Jiayuguan, Wei-Jin Mural Brick Tomb is a big tomb group with over 1,400 tombs built between the 3rd Century and 5th Century during the Wei and Jin dynasties. Renowned as the largest subterranean art gallery in the world, housing a great deal of colorful murals, the gallery has attracted tourists from both home and abroad since 1972 when it was excavated. Most tombs are of families, housing bodies of three or four generations, and now only Grave 6 and Grave 7 are open for China tourism. 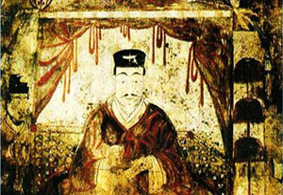 Entering the cold stone tomb, you will Jiayuguanmarvel at the vivid murals and special layout inside. Each Wei-Jin tomb generally has two or three chambers which are connected by corridors paved with tiles in various flower patterns. The gate was decorated with delicate patterns and easy lines symbolizing clouds, water, fire, gods and weird animals. The exquisite murals on the inner chamber walls tell the master and mistress's contemporary carefree life, and servant's hard working one. Most reflect the political, cultural, military, and scientific developments of the Wei and Jin Dynasties, giving an insight into this ancient Chinese feudal society. Mainly painted realistically and earlier than Mogao Grottoes, Wei-Jin Art Gallery provides an example of unmixed Chinese realism art - filling in gaps in the fields of painting between the Wei and Jin periods, and so considered highly valuable for historic research. Apart from these famous attractions, you can also find many other interesting places in this city, such as the famous July 1st Glacier, Jiayuguan Museum and Jiayuguan Glider Base. The most suitable time to visit Jiayuguan is from May to October, as the weather is the most favorable of the year. However, since July is the hottest month of the year; remember to take protective measure for your skin during this period. 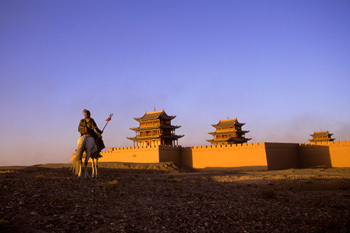 Jiayuguan, one section of Great Wall, is not suitable for China business tours.